Looking for a vacuum for cleaning hardwoods can leave you in a sea of options. Let us help you navigate the market with our top tip and recommendations for the best robot for hardwoods. We think the Roomba 690 is an excellent option for great performance on hardwood floors, but it might not be for you. If you’re looking for a model with different bells and whistles or at a different price point, check out the list below for the complete list of the best robots on hardwoods. Need a little more information to help make your decision? Continue below for our comprehensive review of the best hardwood floor robots. The Roomba 690 is an excellent option if you’re looking for a value robot vacuum that still has great cleaning performance. 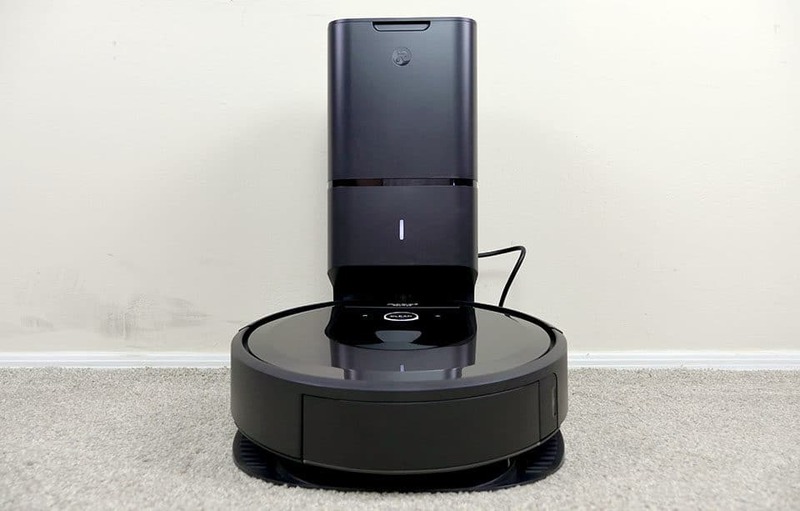 The Roomba 690 doesn’t have any fancy on-board cameras, memory mapping, or Recharge & Resume, and it can’t empty its own dust bin like the Roomba i7+, but it does wifi connectivity for easy control via your smartphone. In our cleaning performance tests, the Roomba 690 scored an average of 94% across all flooring types. On hardwood floors specifically, it scored an average of 97.5% for all debris types (includes rice, cereal, kitty litter, and sugar). See our complete Roomba 690 review here. Long run time: Despite the lower price, the Roomba 690 still has a long run time (up to 90 minutes) which is plenty long enough for most cleaning cycles. Great value: Considering features, wifi connectivity, and overall cleaning performance, the Roomba 690 is an excellent value. No memory mapping: There is no on-board camera or memory mapping technology on the Roomba 690. That leads to a more sporadic traffic pattern as the robot cleans, but doesn’t drastically effect cleaning performance. Struggles with small debris on carpet: If you’re looking for a vacuum that is great for carpet and hardwoods, you may be disappointed with the performance of the Roomba 690 on small debris types (like sugar), where it struggled a bit on our cleaning performance test. The Roomba 675 is iRobot’s most inexpensive robot vacuum that is currently available. It is built with the same design and features as the Roomba 690. In fact, it’s almost identical to the 690 in a number of ways. The biggest difference between the Roomba 675 and 690 is that the 690 includes a virtual barrier wall (while the 675 does not). Beyond that, their features are substantially the same. Please see our Roomba 675 vs. 690 review for the complete comparison and our Roomba 675 review here. Price point: The Roomba 675 is the one of least expensive iRobot robots on the market currently. Value: Despite the fact that it’s one of the least expensive, the overall features and performance make this arguably the best value robot vacuum for hardwood floors (and carpets as well) of anything currently available. No Virtual Wall: The 675 does not include any virtual walls, so you won’t be able to as easily block sensitive areas of your home. However, you can always add these after the fact if you decide you need them. The Roomba 960 is one step down from the 980 in iRobot’s Roomba 900 Series. It has many of the same features as the Roomba 980, including the Recharge & Resume, but lacks Power Boost. Power Boost is a higher level of suction that can make it easier to clean carpeted floors. For only cleaning hardwoods, Power Boost would probably not be a deciding factor between the two models. In our cleaning performance tests, the Roomba 960 scored an average of 93% across all flooring types. On hardwood floors specifically, it scored an average of 100% for all debris types (includes rice, cereal, kitty litter, and sugar). See our Roomba 960 review here. Better value over the 980: If you don’t need the Power Boost for high traffic carpeted areas, the Roomba 960 is a great option, as it had the same cleaning performance on hardwoods as the 980 model. Excellent cleaning performance on hardwoods: For cleaning hardwoods, the Roomba 960 had flawless cleaning performance. Even on carpet, it was able to clean 100% of all debris types except for sugar, where it struggled a bit. Shorter run time: If you don’t need the 120-minute extended run time, the Roomba 960 is a great option. It still has the Recharge & Resume so if it doesn’t finish the cycle in 75 minutes, it’ll charge up and continue when it’s ready. Higher price: Compared to Roomba models outside of the 900 Series, the Roomba 960 is still pretty pricey. It does offer more features and bells-and-whistles, but it shows on the sticker price. The Roomba 890 is a mid-range robot vacuum from iRobot. 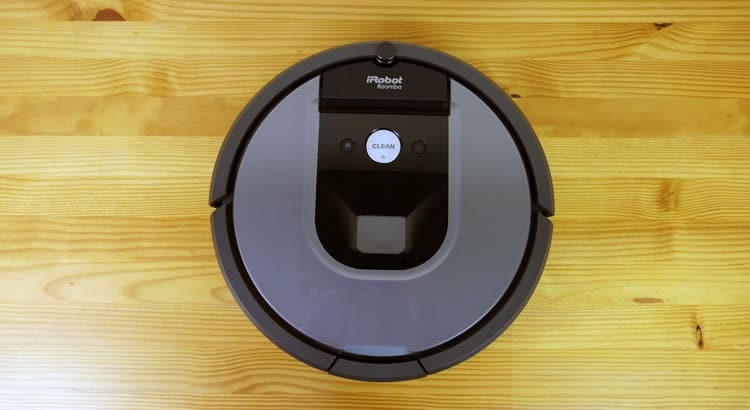 It offers an excellent set of features including wifi connectivity, virtual wall, improved navigation, and a higher performance filter (compared to Roomba 675 and 690). Cleaning performance on hardwood floors was excellent. The Roomba 890 scored a 98% on our hardwood floor cleaning tests. Overall cleaning performance scores were 93%. However, most of the struggle was related to removing sugar on carpets. See our complete Roomba 890 cleaning tests and review here. High Performance Filter: one of the biggest differences between the Roomba 890 and others is the high performance filter. If you suffer from allergies or have pets, the finer filter can definitely help. Better Navigation: the 890 also has a number of improved navigational features compared to less expensive robot vacuums. It’s a good mid-range price tier, considering the level of features and overall performance. Fine Debris on Carpet: since you’re here because you’re looking for hardwood floor cleaning performance, this may not matter to you, however, the biggest area of struggle for the 890 is removing sugar (and other ultra fine / heavy debris) from carpets. As far as cleaning hardwoods go, it’s as solid as any robot, scoring a 99% on our cleaning tests on hardwoods. Read our complete Ecovacs Deebot N79 review here. Price: the price point is definitely one of the biggest pros with the Ecovacs Deebot N79s. It’s one of the least expensive (but still high performing) robot vacuums on the market. Overall Value: Despite the price, the N79s comes with a ton of features that you typically only find at high price tiers. Most notably, it includes wifi control, HEPA filtration, and a 100 minute run time. Carpet Cleaning – as we’ve said above, this may or may not matter to you. If you’re just using the Deebot N79s for hardwoods, then it’s amazing. However, it does struggle more on carpets, where it scored a mediocre 85.6% on our low / high pile carpet cleaning tests. The Roomba E5 is from the newest collection of iRobot. It’s more affordable and the i7 and i7+ models, so it offers a nice “middle of the road” option for people who want the newer style, but don’t necessarily need all of the bells and whistles. In our cleaning performance tests, the Roomba e5 scored an average of 99% across all flooring types. On hardwood floors specifically, it scored an average of 100% for all debris types (includes rice, cereal, kitty litter, and sugar). Read our complete Roomba e5 review here. Excellent value: If you’re looking for top notch cleaning performance and features for a mid-range budget, it’s hard to beat the performance of the Roomba e5. Wifi connectivity: The e5 offers wifi connectivity for control from your smartphone or voice control (when paired with Amazon Alexa or Google Assistant, etc. No on-board camera: The Roomba e5 lacks an on-board camera to help map out your home. This can cause some navigational issues in some cases. No Recharge & Resume: If you like the ability to charge up in the middle of a cycle and then resume cleaning where it left off, you may be disappointed. Unlike the Roomba 960, 980, and i7 / i7+, the e5 does not have this feature. If you want the “best of the best” then it’s hard to beat the Roomba i7+ robot vacuum. This is one of the newest and most advanced robot vacuum to come out of the iRobot lineup and it’s got one special feature that truly sets it apart. The Roomba i7+ has a self-emptying dust bin designed into the base. When it completes a cleaning cycle, the robot returns to the charging base where it will deposit the debris from the vacuum itself into a separate disposal bag located in the Clean Base. No hands needed. No special programming. It does it on its own and is then ready for its next cleaning cycle. The cleaning case can store up to 30 loads of debris from the robot vacuum before needing to be emptied. How is the Roomba i7+ Hardwood Cleaning? On top of excellent hands-free features, the Roomba i7+ also boasts excellent cleaning performance. In our cleaning performance tests, the Roomba i7+ scored an average of 99% across all flooring types. On hardwood floors specifically, it scored an average of 99% for all debris types (includes rice, cereal, kitty litter, and sugar). Read our complete Roomba i7+ review here. Self-emptying dust bin: The Roomba i7+ has a dust bin that automatically empty the contents from the vacuum, saving you time and maintenance. Great navigation: The Roomba i7+ has an on-board camera which helps it to navigate in straighter and more methodical patterns. You can even specify zones in your house on the smartphone (like bedroom, kitchen, etc.) and send the robot to one specific spot for cleanings. Very expensive: All of these bells-and-whistles makes the Roomba i7+ one of the most expensive robot vacuums on the market. If you’re not looking for such an advanced robot, you may experience a bit of sticker shock. Outside of the Roomba lineup, there are a few other robot vacuums that are making waves in robotic cleaning. First to feature is the Xiaowa Lite C10. This robot vacuum is affordably priced, has a modern white aesthetic, and wifi connectivity. In our cleaning performance tests, the Xiaowa Lite scored an average of 94% across all flooring types. On hardwood floors specifically, it scored an average of 99.75% for all debris types (includes rice, cereal, kitty litter, and sugar). Read our complete Xiaowa Lite C10 review here. Extremely long run time: The Xiaowa Lite has one of the longest run times we’ve seen to date, stretching up to 150 minutes and housing a 2,600 mAh battery on-board. A decent value: If you’re looking for a robot vacuum that’s a little less expensive than some of the top-tier Roomba, the Xiaowa C10 may be a great option. It still has wifi connectivity, good cleaning performance, and an unusually long run time. Poor cleaning performance of fine debris on carpet: If you’re looking to only clean hardwoods, this point may not be relevant, but for any carpet cleaning, the Xiaowa Lite really struggled with sugar during our cleaning performance test (only captured 56%). Manufactured overseas: If you’re looking for a local robot vacuum, you may not like Chinese origins of the Xiaowa Lite. While widely popular in the east, robot vacuums manufactured overseas may have more issues finding replacement parts. In our cleaning performance tests, the Tenergy Otis scored an average of 94% across all flooring types. On hardwood floors specifically, it scored an average of 96% for all debris types (includes rice, cereal, kitty litter, and sugar). Read our complete Tenergy Otis review here. An amazing value: The Tenergy Otis is a relatively low price compared to other models on the market. While it lacks any truly fancy bells and whistles, it does have a few new features that make this vacuum user friendly and a powerful performer. No wifi connectivity: There is no wifi connectivity on this robot so you can’t control it from your smartphone. But you can control it from the wireless remote control (included with original purchase). Cleaning technique: During our cleaning test, we noticed two things about the Tenergy Otis that caught us off-guard. One, it has a tendency to fling debris around as it is cleaning it up. And two, it struggles a bit with getting into tight corners. While these issues didn’t seen to effect the overall leaning performance, it seems like it should be added in for consideration. What’s the best robot vacuum for hardwoods? So we’ve covered quite a few robot vacuums out there. There is no shortage of options and many different models are great performers on hardwoods. Selecting the best robot vacuum for you really comes down to the features you’re most interested in. The Roomba 690 is a perfect balance of performance vs. costs. It scored a 97.5% on our hardwood floor cleaning tests, has wifi connectivity, strong performance on other floor types, and is incredibly affordably. Robots that have better performance tend to be about double the price. In our view, that’s a lot of money to spend for an extra 2.5% cleaning performance. The Roomba 675 is basically the same as the 690. It has wifi connectivity, similar cleaning performance, and all the same features. The only major difference is the 675 does not include a virtual wall barrier. Read our 675 vs. 690 comparison battle here. If you don’t need the wall barrier you can definitely save some money. I would recommend the Roomba 890, Roomba 960, or Roomba e5. All 3 of these robot vacuums use dual rubberized brushrolls, which are ideal for removing pet hair (especially from hardwood floors). Additionally, all 3 of these robot vacuums use high performance filtration systems, which will help to further deal with pet dander. I would recommend the Roomba e5. This robot vacuum is less expensive than the i7 models, as well as the 960, but it still provided 100% cleaning performance on hardwood floors. For the best robot vacuum for hardwoods, what else could you ask for besides flawless performance? I would recommend the Ecovacs Deebot N79s, Tenergy Otis, or Xiaowa Lite C10. All 3 of these robot vacuums offer excellent cleaning performance on hardwoods at a low price. They don’t have all the bells and whistles, but they still get the job done. I would recommend the Roomba i7+. The i7+ is the only robot vacuum to date that has a self-emptying dust bin. This allows the vacuum to deposit the contents of its dust bin directly into the cleaning base. The base can hold up to 30 full cleaning cycles of debris. Still not sure what robot vacuum is best for you? Please feel free to send us an email here. We’re always happy to help!